Blackmagic Forum • View topic - Default bitrate too high? Under the "Deliver" tab, there is a "YouTube" option with 3 sub options(2160, 1080, 720). When selecting one of these options there are preset settings, one of these is the "Quality" which is referring to the bit rate. About 2 Davinci Resolve versions ago, the automatic bitrate for 1080 was about 10,000kb/s. Now the automatic bitrate is about 125,000kb/s! A huge jump. This means the rendering takes 10x longer, the file size is 10x larger and uploading to youtube takes 10x longer. This must be an overkill and perhaps even an error. When I view a project that is 125,000 vs 10,000 kb/s, there is no difference in quality(very similar projects). I know I can manually change the bit rate, and I think I will from now on. But anyone have any idea why the default bitrate went from 10,000 to 125,000? I honestly don't really even know what bitrate means and what number I should use. But if something is going to take 10x longer and take up 10x more space, I need to see some improvement. Maybe not 10x better but at least a noticeable improvement. Re: Default bitrate too high? I don't see that here, my values are still the same as before. Maybe a fresh install will help? hellagrant wrote: I honestly don't really even know what bitrate means and what number I should use. Bitrate itself isn't complicated. Just like when you save an image to .jpg you know that there are variable levels of compression. If you add more compression you'll get smaller files, but at some point they will start to fall apart. Jpeg compression is destructive and data gets discarded. But as it turns out, normally we can do quite a bit of compression before visually losing image quality. Bitrate is "data over time". If you have a bitrate of 10.000 kb/s and you have a clip that is 25 fps, you'll have 400 kb per frame at your disposal. OK, this is simplified since codecs typically don't distribute data perfectly per frame like that, but you get the idea. As codecs become increasingly sophisticated, they can deliver the same quality with less data thanks to advanced algorithms, The flip side is that they become more computationally intensive. If you look at the iTunes Store you'll see that a typical movie is around 5-6GB for full HD. The movie 'Venom' is 1h52min and 5.67GB. This boils down to an average bitrate of approximately 7077 kb/s. Let's assume Apple is being "aggressive but not going overboard" with compression. I think 8000-10.000 is a good target for HD if you want to actually compress the files. Some users might freak out saying that any 2h-ish movie that is less than 15GB is trash, so it's all subjective. 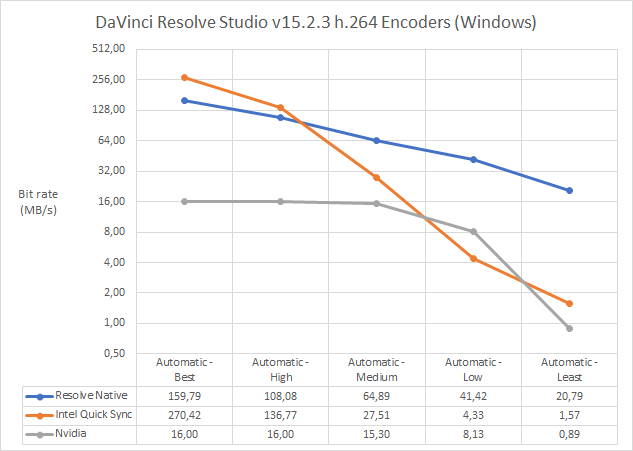 The Resolve native h.264 encoder on Windows does now use a very high bit rate. Quality is much better than it used to be though. It used to be unusable. roger.magnusson wrote: The Resolve native h.264 encoder on Windows does now use a very high bit rate. Nice visualisation. But should the Y axis be Mb/s? On my Mac a HD file comes in at around 22 Mbit/s and UHD at 84 Mbit/s. Both with the 'automatic' setting. What frame size did you check for? Hi, it's actually megabytes. It's a UHD clip originally shot on film, forgot to add that detail here, it's in the linked thread. It's a sort of worst case scenario clip of a crowd of running people. roger.magnusson wrote: Hi, it's actually megabytes. So you're exporting h.264 files out of Resolve that runs 7.5 GB per minute? ADD: For Reference, ProRes 422 for 4K 25 fps runs at 65.5 MB/s, or 524 Mb/s. It's not something I do regularly, it was just for that thread where I wanted to compare the new h.264 options in Resolve on Windows/Linux. With bitrates twice as high as for ProRes 422, but for long GOP h.264, I'd consider those numbers a bug worth reporting. But looking at my own test where I got 84 Mbit/s for a UHD clip, I think that lines up nicely with your chart, if the units were different. I'll leave it at that! =). Yeah, it's not a "normal" clip to be sure. I think I used the words "insanely high bit rate" when describing the chart.